The new Häagen-Dazs Honey Bee Haven at UC Davis will be dedicated Sept. 11, but it is already buzzing with activity, according to a feature that appeared in Saturday's Sacramento Bee. The half-acre refuge is already home to more than 6 million bees representing 55 species, including bumblebees, carpenter bees, leaf cutters, borer bees, mason bees and sweat bees, the article said. The garden was transformed from a neglected patch of land - described as a giant concrete brick by the program manager - into a bee sanctuary of mostly drought-tolerant, easy-care perennials and shrubs that bloom year round. The compost for the garden came from scraps from campus cafeterias. 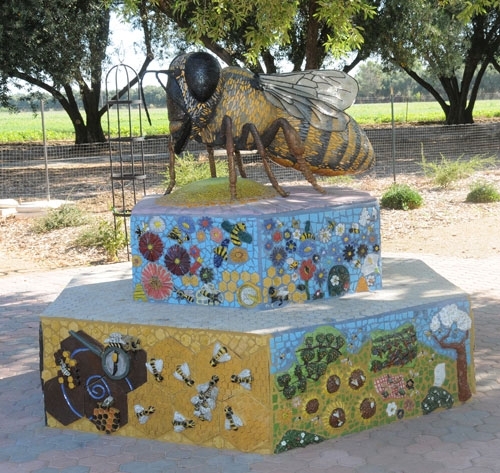 A giant honey bee sculpture sits on a pedestal decorated with mosaics by schoolchildren, UC Davis students and others. Interest in bees has grown in recent years due to the insects' well-publicized struggle with colony collapse disorder. "A lot of people are asking, 'What can I do to help?'" UC Davis entomologist Eric Mussen told Bee reporter Debbie Arrington. Many California crops are dependent on bees for pollination, such as melons, squash, cucumbers, cranberries, raspberries, strawberries, blueberries, sunflowers, alfalfa, buckwheat, clover and almonds. "We grow more than 700,000 acres of almonds in California, and every acre needs two to three hives," the story quoted Kathy Garvey of the UC Davis entomology department. The Häagen-Dazs Honey Bee Haven is open to the public everyday from dawn to dusk. The grand opening is from 10 a.m. to 2 p.m. Sept. 11. For more information and directions to the haven, see the Häagen-Dazs Honey Bee Haven website. The bee sculpture in the Häagen-Dazs Honey Bee Haven at UC Davis.